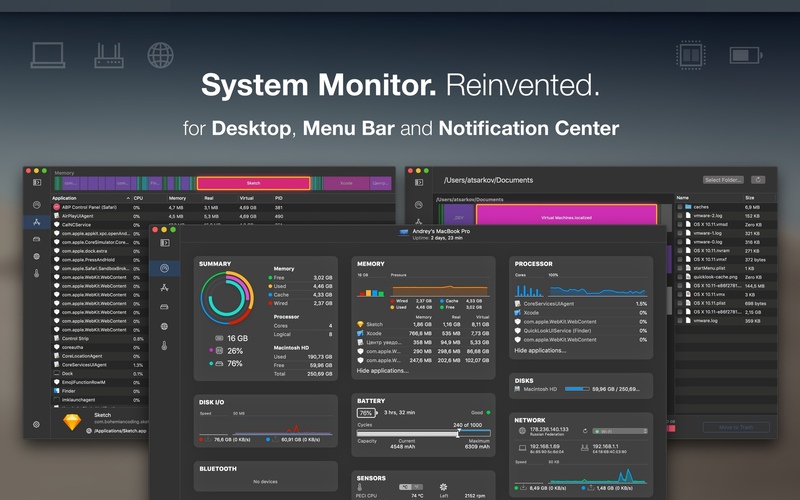 iStatistica Pro lets you overview your battery statistics, realtime informations about CPU, RAM usage and much more. Network statistics includes external, gateway and local IPs, speed and data rates chart. iStatistica Pro offers web-access to track CPU, Memory, Disk and Sensors statistics over local area network. Just enable web-access in application settings and point your browser to Mac’s address. Pro version includes exclusive modules for folders and drives visualization, detailed apps monitoring and more focused on enterprise-level security for remote access.